IF YOU’RE MISSING A TOOTH, OR SEVERAL TEETH, we want you to know there are remarkable replacement options. One option to consider is dental implants. Dental implants are artificial tooth “roots”—usually made of titanium—that are placed in your jawbone and covered by a natural looking tooth replacement (crown). Tooth loss can often lead to bone deterioration in the jaw, which can give your face a sunken appearance. Dental implants can help keep your bone and facial structure intact—so you can look and feel your best. Replacing teeth with dental implants is as close to natural teeth in look, feel and function that we can offer today so that smiling, speaking, and eating is as natural and comfortable as possible. Neighboring teeth are not altered or damaged when implants are placed. 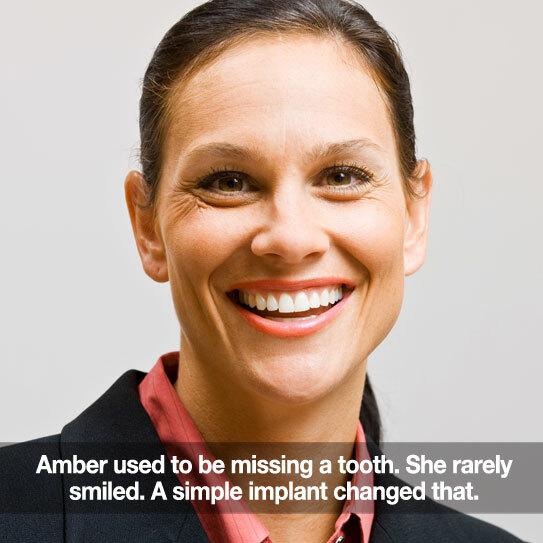 In fact, implants can help preserve the structure and positioning of your teeth. Implants need to be maintained and don’t complicate oral hygiene. You can continue to practice the same care you always do while brushing and flossing. Selecting the ideal treatment method is very important. Here are a few simple illustrations that reference some of these treatment methods. When you have a consultation appointment, we’ll be sure that you understand everything and help you determine what the best course of action will be for you. If you’re hiding your smile because of a missing tooth (or teeth), stop! Dental implants are a solution and can have a positive impact on your appearance, comfort, and health. They can help give you the confidence you need to smile proudly! So, what are you waiting for? Call us today and we’ll walk you through the dental implant process, start to finish, and answer any questions you may have. If you know someone who could benefit from this information, please share this post with them! Thanks. ‹ Men 33% Less Likely Than Women To Seek Preventive Dental Care: Whats Up, Dude?